Current scholarship information pertains to incoming international students for fall 2019. It may not be applicable to prior or future incoming students. West Virginia University strives to provide its students with an inclusive educational experience. We are pleased to offer incoming, freshmen international students the opportunity to receive academic scholarships. Scholarships listed may only be utilized at the Morgantown campus. International students graduating from a high school located within the United States will be considered for "Institutional Scholarships for Incoming Freshmen" instead of the international scholarships below. International students who are admitted as incoming transfer students to WVU will be considered for our "Transfer Scholarships" instead of the international scholarships below. Graduate-level international students may consider pursuing graduate assistantships by searching for positions on our MountaineerTRAK job search engine at studentemployment.wvu.edu. Scholarships are awarded on an ongoing basis beginning approximately November 1. Scholarships listed may only be utilized at the Morgantown campus. Grade point average (GPA) is based on information received from your high school transcript. High school transcripts are evaluated by the WVU International Admissions and converted to a 4.0 scale. SAT or ACT test scores are required for College scholarship consideration. These include: College of Business and Economics Dean’s Scholarship, Davis College of Agriculture, Natural Resources and Design Dean’s Scholarship, Engineering Excellence Scholarships, and Reed College of Media Dean’s Scholarships. The Engineering Excellence Scholarships also require a minimum SAT or ACT Math score. The SAT scores for scholarship consideration are based on the Evidence-Based Reading & Writing score plus Math score (out of 1600 possible). This is the format used by SAT starting in March 2016. WVU uses “Super Scores” for scholarship consideration, so be sure to submit all scores from each section of the ACT or SAT if you take the test more than once. We will calculate your “Super Score” using the highest component/subscore from each section of the tests submitted to us. Please note that scores from the previous, pre-March 2016, version of the SAT and the new version cannot be mixed to obtain a super score. Amounts listed below under the “Value” section for each scholarship are effective for the incoming freshman class starting fall 2019 and are not retroactive to previous classes or currently enrolled students. Students entering WVU prior to the fall 2019 semester may have been awarded different scholarships and/or different amounts. Scholarship amounts may be affected if students are receiving additional financial aid or assistance. The following University scholarships may not be combined with each other: International Scholarship Level 1, International Scholarship Level 2, and International Scholarship Level 3. If a student is eligible for more than one of these scholarships, the student will be awarded the one scholarship with the highest dollar value. The following College scholarships may not be combined with each other: College of Business and Economics Dean’s Scholarships, Davis College of Agriculture, Natural Resources and Design Dean’s Scholarships, Engineering Excellence Scholarships, and Reed College of Media Dean’s Scholarships. College scholarships are awarded based on a student’s primary major only. If a student is eligible for more than one level of a College scholarship, they will be awarded the one scholarship with the highest dollar value. The list below provides the basic criteria for each scholarship. Click on the name of the scholarship for values, criteria for consideration, deadlines, how to apply, and renewal information to maintain the scholarship. Please note that no separate application is needed for most of these scholarships (unless otherwise noted in the scholarship information). Information used with the calculator. Davis College of Agriculture, Natural Resources and Design Dean’s Scholarship Level 1 See scholarship chart for criteria. Davis College of Agriculture, Natural Resources and Design Dean’s Scholarship Level 2 See scholarship chart for criteria. Engineering Excellence Level 1 Scholarship See scholarship chart for criteria. Engineering Excellence Level 2 Scholarship See scholarship chart for criteria. John Chambers College of Business and Economics Dean’s Scholarship Level 1 See scholarship chart for criteria. John Chambers College of Business and Economics Dean’s Scholarship Level 2 See scholarship chart for criteria. Reed College of Media Dean’s Scholarship Level 1 See scholarship chart for criteria. Reed College of Media Dean’s Scholarship Level 2 See scholarship chart for criteria. $4,000 per year for four undergraduate years or a bachelor's degree - whichever comes first. Students must stay within an academic major offered by the Davis College of Agriculture, Natural Resources and Design. 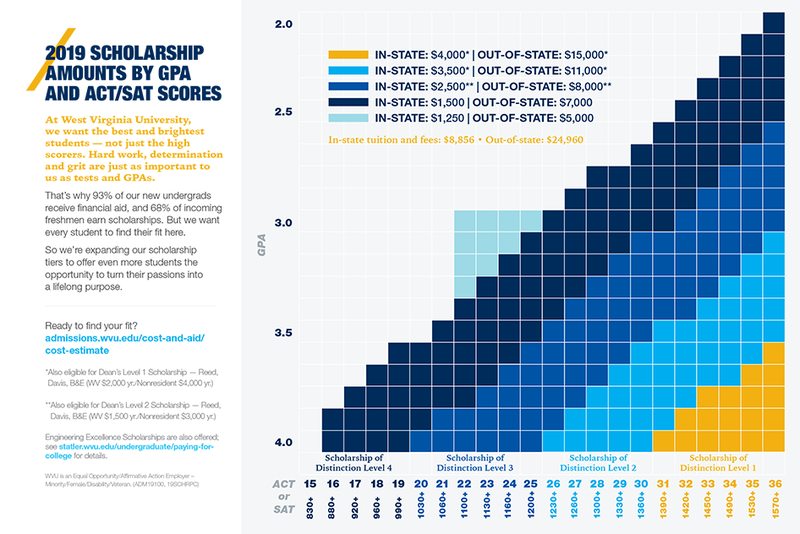 See scholarship chart for GPA and test score criteria. Students initially awarded this scholarship for Fall 2018 or later may be eligible for a similar scholarship should they change their major into the College of Business and Economics or the Reed College of Media. Complete admissions process by May 1, 2019.
Review renewal requirements for all scholarships. $3,000 per year for four undergraduate years or a bachelor's degree - whichever comes first. $5,500 per year for four undergraduate years or a bachelor's degree - whichever comes first. Students must stay within an academic major offered by the Statler College of Engineering and Mineral Resources. See scholarship chart for GPA and test score criteria. A minimum ACT Math: 32 or SAT Math: 720 is also required. $4,500 per year for four undergraduate years or a bachelor's degree - whichever comes first. Students must stay within an academic major offered by the Statler College of Engineering and Mineral Resources. See scholarship chart for GPA and test score criteria. A minimum ACT Math: 29 or SAT Math: 680 is also required. $7,000 per year for four undergraduate years or a bachelor's degree - whichever comes first. Must have a minimum incoming GPA of 3.50. Must complete the admissions process and be admitted to WVU by April 1 for the upcoming academic year. $6,000 per year for four undergraduate years or a bachelor's degree - whichever comes first. Must have a minimum incoming GPA of 3.25. $5,000 per year for four undergraduate years or a bachelor's degree - whichever comes first. Must have a minimum incoming GPA of 3.00. Students must stay within an academic major offered by the College of Business and Economics. See scholarship chart for GPA and test score criteria. Students initially awarded this scholarship for Fall 2018 or later may be eligible for a similar scholarship should they change their major into the Davis College of Agriculture, Natural Resources and Design or the Reed College of Media. Students must stay within an academic major offered by the Reed College of Media. See scholarship chart for GPA and test score criteria. Students initially awarded this scholarship for Fall 2018 or later may be eligible for a similar scholarship should they change their major into the College of Business and Economics or the Davis College of Agriculture, Natural Resources and Design.